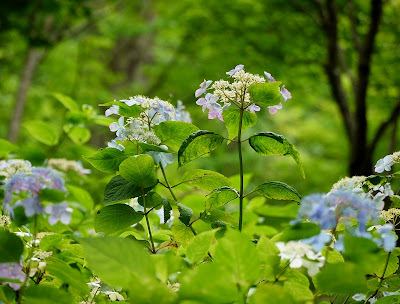 Hydrangea, “ajisai” in Japanese, is floral symbol of Japanese rainy season. 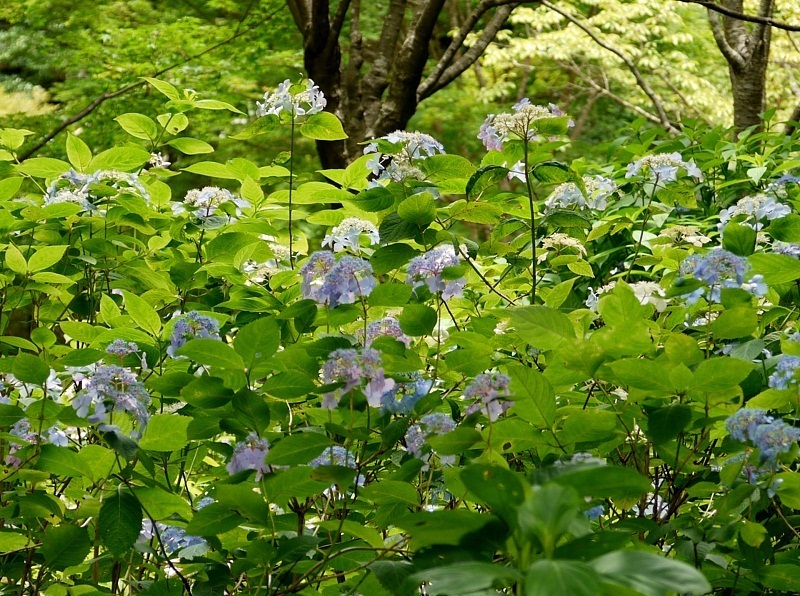 Prior to the ajisai season, this post is about Japanese origin species and lacecap hydrangeas. 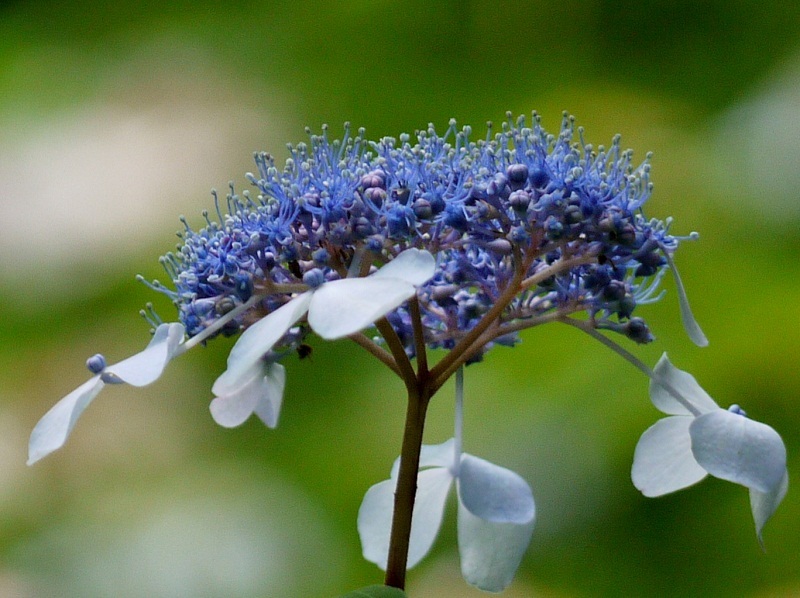 They have delicate and lacy flower heads. 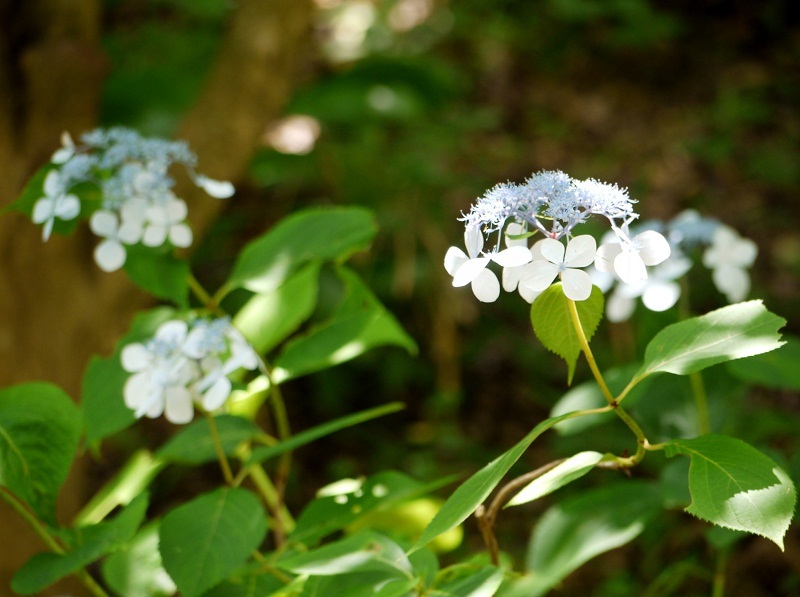 Japanese Ajisai back home and introduced them in his Flora Japonica. "Hydrangea Japonica" named by Siebold which you see at the bottom of the picture was changed to "Hydrangea macrophylla (Think.) ser." later. Hydrangea macroplylla is a species of hydrangea native to Japan. The outside parts some people would think petals are actually sepals: that's why they are called がく紫陽花 sepals hydrangea in Japanese. 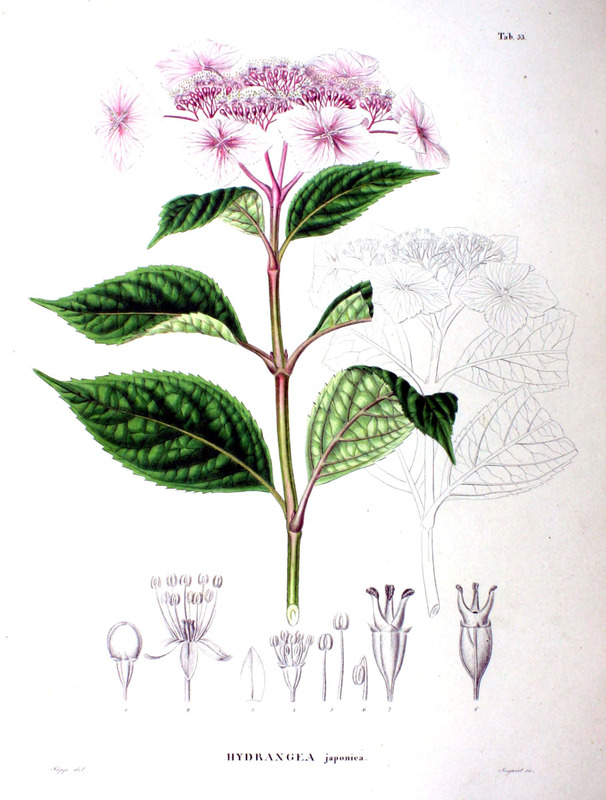 The central small flowers are fertile and are surrounded by sterile flower with sepals. 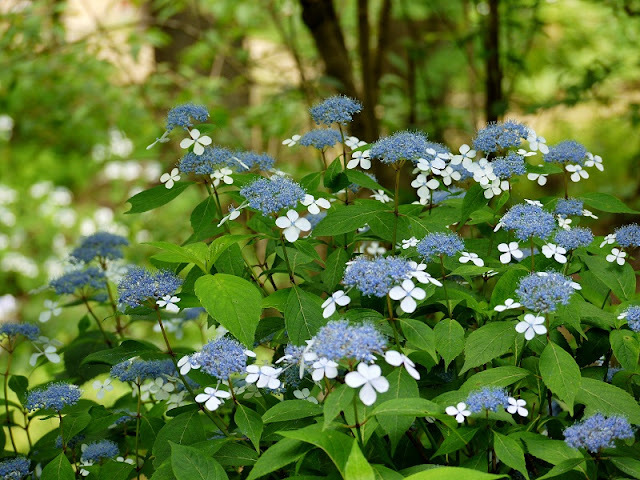 This is also hydrangea native to Japan which was introduced in the Flora Japonica. 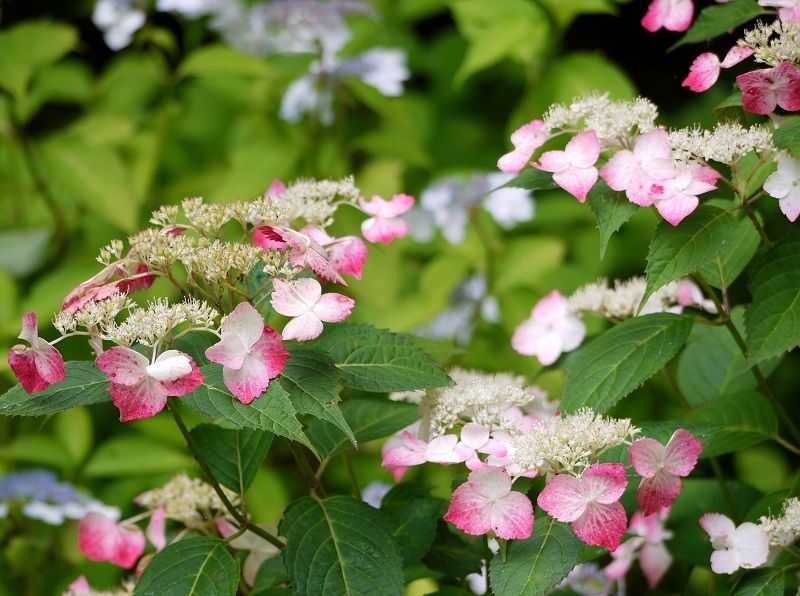 Seabold called it "Hydrangea otakusa" named after his Japanese lover "Otaki-san". The name was changed to more scientific name, "hydrangea macrophylla" later. Hydrangea macrophylla is basically blue. 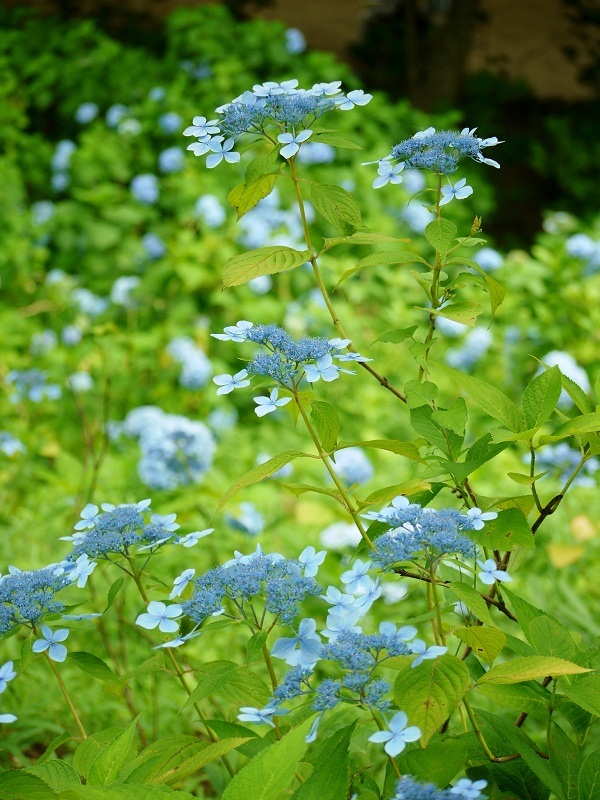 The origin of the Japanese word Ajisai was "Azu Sa Ai" which means “gathering blue colors”. 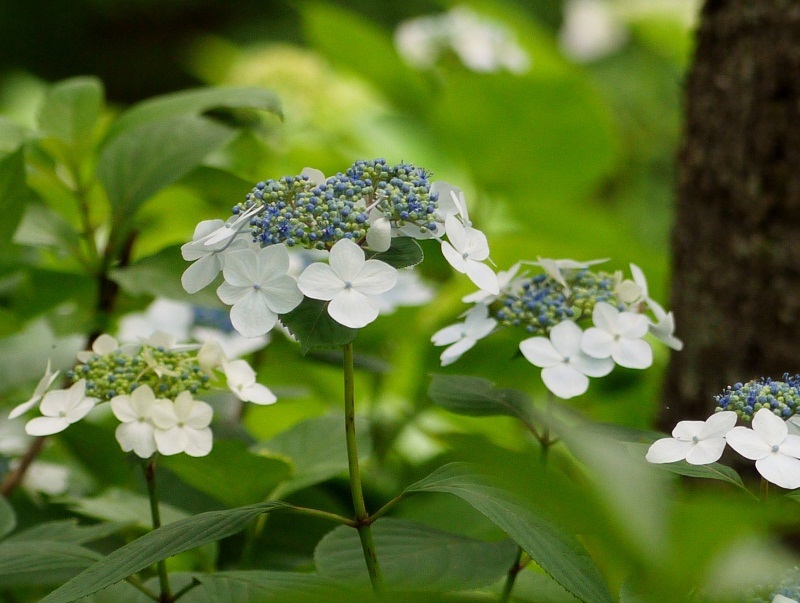 In 20th century, gorgeous ajisai in various colors with larger flower heads, which were hybridized in the western world, returned home. What a gorgeous post! So delicate, so wonderful and full of information. I love hydrangeas and your shots are very pretty. Absolutely gorgeous flowers and pictures ! Yoko,you have captured so well the lace like appearance of these flowers in your lovely photos. 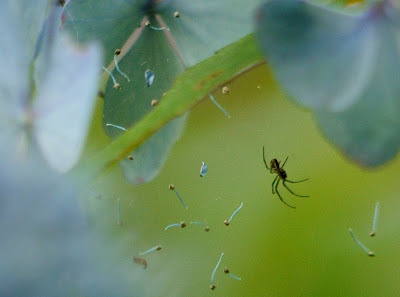 I notice how the central flowers in image six echo the shapes of the spider legs.....fascinating! 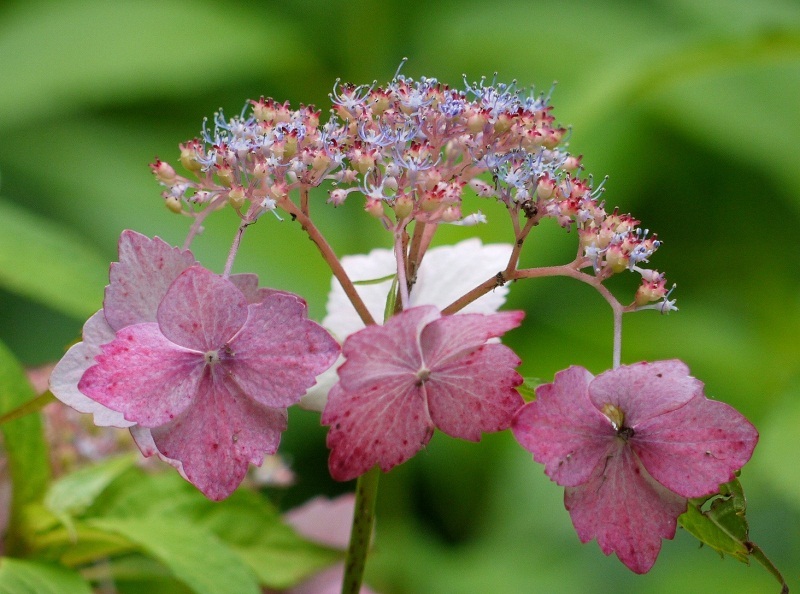 The pastel, fragile beauty of the Japanese varieties of Hydrangea are especially lovely. They are a gift for the eyes in shaded areas. Your photos of them are spectacular. How delightful to see these flowers in the wild. I have never seen that. I am always interested in hydrangeas because of their strange colours. Your photos, as usual, are beautiful. I particularly love the one of the seeds flying away. In English gardens you sometimes see a climbing hydrangea which has that delicate lacy look to it, although the flowers are usually white. They are so beautiful, Yoko! How delightful, petite and delicate shades of blooms, Yoko and how fascinating that they are the ones eventually ringing the bell for the rainy season. All your pictures of them are absolutely wonderful, including that of the spider who seems to be thoroughly enjoying his company. such a gorgeous hue of blue! The best blue in the world! Dear Yoko, I 'borrowed' 1 of your lovely photos for my monitor screen. You don't mind, do you? It looks so peaceful, the best for a hactic time I'm going through - the end of the term. Thank you ever so much. Let ypor little ones be come and happy! Thank you. I’m glad you liked these photos. I wonder which you chose. I downsized the photos when installing to the blog, so hope the resized photo be suitable to your monitor screen. I had to look for the fairies! You have captured pieces of paradise. All light and grace...just the place...where fairies find...their space to be...whatever they must...to you and me. Such a delicious post. I'm thinking you must be a teacher...for here is a wealth of information presented in such an interesting way. In response to your comment on the "Weather" poem, I got to thinking that some people do worship "nature," and others worship an ancient Near Eastern deity, claiming said deity created "nature" and thus deserves worship over all other deities. I remember the story of a famous scientist from the U.S. He is still very active and he is a "Christian." His "faith journey" began on day when hiking in the mountains and he stumbled on a scene of overwhelming beauty - a river, rocks, sunlight, and more. It was then, he said, he realized there was a god who had created all this and so he decided to become a Christian. It's hard for me to imagine such foolishness, especially from a scientist. Both nature and the scientist's deity (as the latter is presented in the Hebrew Bible) are capable of astounding beauty and bringing forth the good in human life. Yet both are capable of incredible evil, sending catastrophic death and pain young and old, the innocent and not so innocent. In this post you present nature's benign face - a thing of glorious beauty. And we should revel in the opportunity to draw near to such beauty and share in altruistic impulses it may ignite within us. But...there's always a "but." We should, I think, not forget nature's less benign attributes which destroy not only hope but life itself. Thus, when we come face to face with nature (or the ancient deity, Yahweh), we do not bow down in worship, but stand tall to enjoy the bounty nature brings while at the same time strive to survive the tsunamis, tornadoes, hurricanes, disease, and pain and suffering with which we are too often confronted. Those who believe in omnipotent and omnipresent gods have no answer to the problem of natural disasters or human evil. Still, the human spirit sometimes prevails. 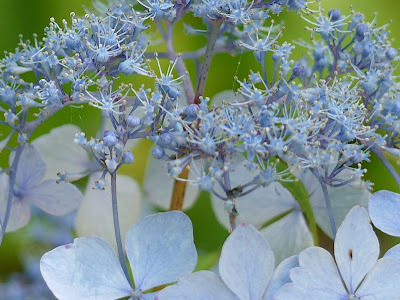 Such magical shots of the hydrangea. I loved reading about their history too. How I love those delicate light blue and pink colours. The world of flowers is a paradise and you give it full credit. Your photos are SO beautiful. As always. Thank you. Now it is summer here in Denmark. It is so lovely. Hortensje są piekne. Mają śliczny kolor i są bardzo delikatne. Opisy i zdjecia są wspaniałe. Pozdrawiam. Hydrangeas are beautiful. They have a beautiful color and are very fragile. Descriptions and pictures are wonderful. Yours. 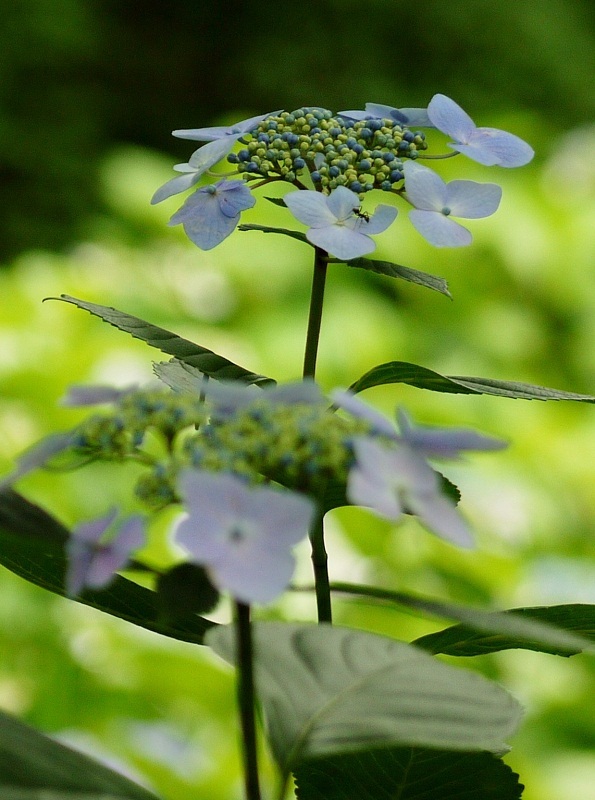 The native Japanese hydrangea is quite different with its cluster of small flowers in the centre. This post is interesting and educational. Have a happy weekend Yoko! 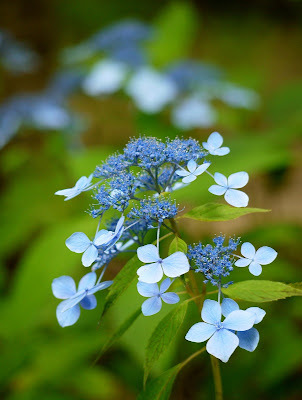 Wonderful shots of this blue Hydrangea species, dear Yoko. The same Hydrangea blossoms in combination with white roses decorated the interior of the church of my friends who married two weeks ago on the German island of Sylt! 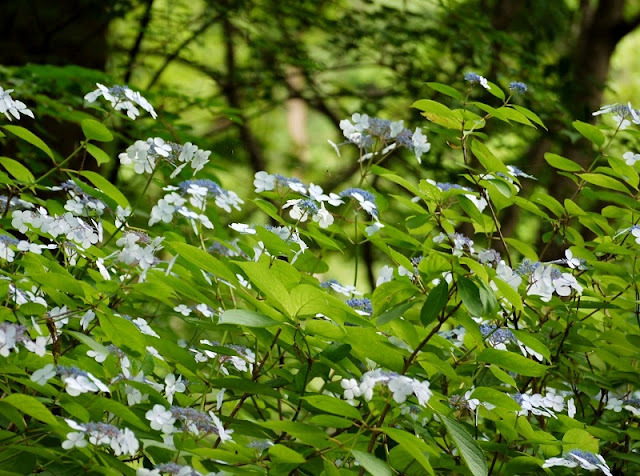 Currently you can find these beautiful shrubs in many of our parks as well, dear friend. Beautyful Blue and pictures! And Thank You for Your visiting in my blog! Beautyful flowers and beautiful pictures.